Former Hog Russ Grimm was awarded his Pro Football Hall of Fame ring Sunday at halftime of the Redskins-Colts game at FedEx Field. Former teammate Jeff Bostic looks on. 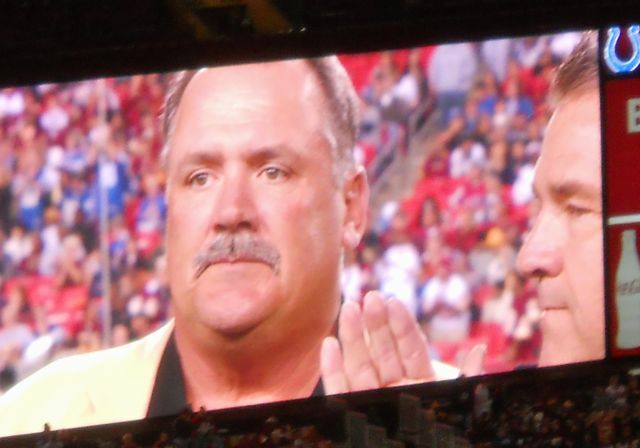 Former Redskins guard Russ Grimm was awarded his Hall of Fame ring at a halftime ceremony which former Hogs George Starke, Jeff Bostic, Joe Jacoby, Rick “Doc” Walker, Fred Dean, and offensive line coach Joe Bugel attended. Grimm, an assistant coach with the Arizona Cardinals, was able to attend because the Cardinals have a bye this week. It was a great moment, but too many of the fans left their seats at the half, which was a little disappointing. Two hours before the game, the former players circled FedEx Field in a parade. Shortly before kickoff, the team introduced the 62 former Redskins in attendance who played from the 1960s to 2004 as part of “Homecoming,” an alumni weekend organized by general manager Bruce Allen. It’s nice to see the team honoring former players, because, strangely, Snyder hasn’t done a good job of that until recently. This entry was posted on October 24, 2010 at 11:25 am and is filed under Uncategorized. You can follow any responses to this entry through the RSS 2.0 feed. Both comments and pings are currently closed.